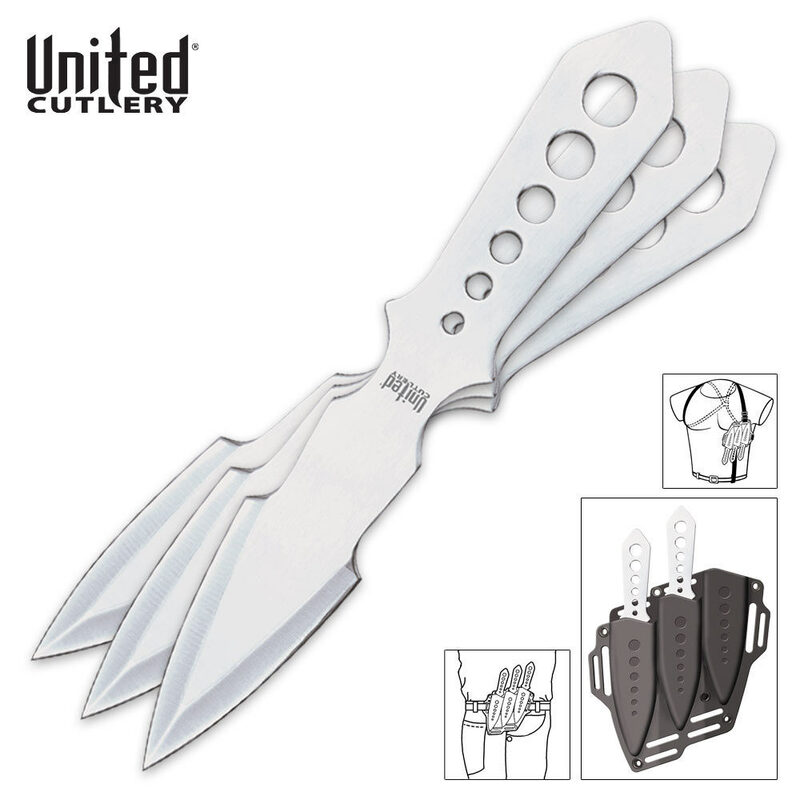 Shaped like a lightning bolt, these throwing knives utilize one-piece stainless steel with sharp edges and piercing points for deep target penetration. The aerodynamic cut-out designs in the handle help to ensure accuracy and smooth sailing right into your target with every throw. The included hard plastic belt sheath houses all three blades for safe, convenient storage and transport. These throwers are awesome. They come sharp right out of the box. The sheath is fantastic and even the straps are great. My only issue is that I bought the same exact item probably almost ten years ago from this catalog and the throwers back then were a lot thicker, bigger, and heavier. That's what I was expecting to get. The price is the same as when I bought it back then but they have been reduced is size. Guess its the economy. Event the sheath is smaller. Still a really good buy!!!! I really like these blades! They're well balanced, sharp and extremely fun to throw! I would recommend them to anybody looking to get into knife throwing. 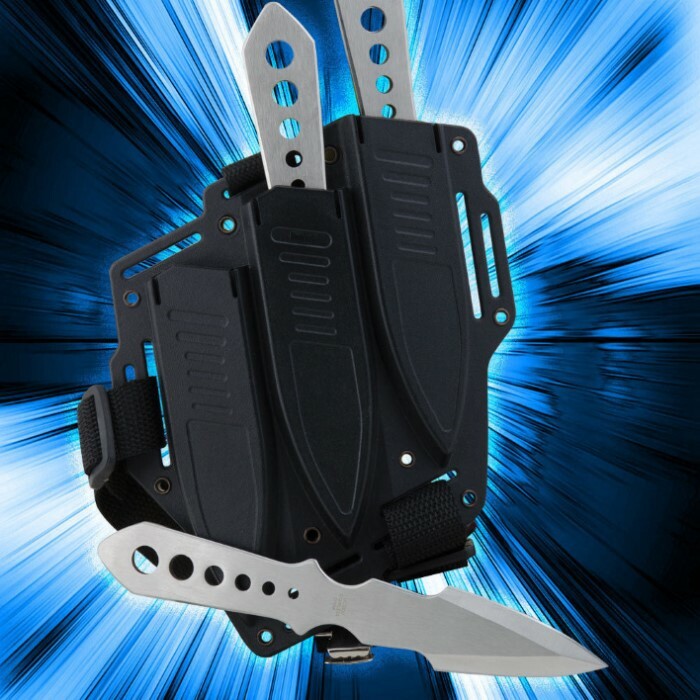 The only reason why I didn't give this product a higher score is because the holster didn't really hold the blades in place. The first time I put the harness on, a couple of the blades fell out. Other then that, I'm very pleased with my purchase and I will be ordering more products from this site! These throwing knife were fun to throw for hours. I got them about a couple of days ago and couldn't stop playing with them. I would suggest to anyone getting these that they should throw them for about an hour then look them over because after throwing them the tended to bend the tips and wear the sides. All you have to do when a knife tip bends is you find a iron or cement surface like an anvil or the slab of cement and hit it hard on the tip with a hammer while the knife is laying on that afore mentioned hard surface. First set of throwing knives that I have ever used. Was very easy to learn how to throw them and get to stick. I've been throwing them a little over 2 months and tips are starting to bend but worth the money. I bought these because of my tight budget. I know that shorter throwing knives aren't the best, but its good to practice with! I really like these, but it will take practice before you can get them to stick. I recommend buying a pine wood target from a hardware store. Great first throwers, and they can take a beating! I just got these 2day and they r great very sharp well balanced for throwing but if u r a larger guy the straps r a little small so i took them off. the sheath is a little lose so the knives fall out very easily but over all great knives and i know a good knife when i see 1 i have been collecting since i was 10.
haven't got it yet but i think this might be a good set of knives. (i am a beginner at this throwing knives thing i am more of a sword person.) Editor's Note: Thank you for your comments. We have updated the review to reflect the appropriate spelling. I normally use heavier throwing knives, so these were hard to get accustomed to. The sheath was unique and functional. You can see these knives in action in the movie Resident Evil: Apocalypse. Milla uses them on the Umbrella Corps. soldiers towards the end!